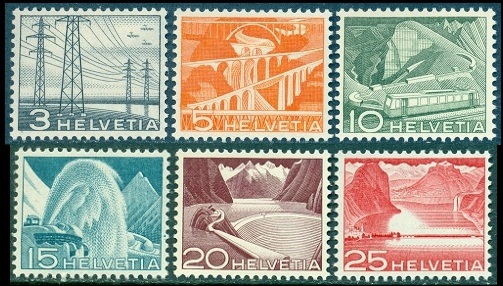 A new definitive series of Swiss stamps, with a theme of Technology and Landscapes, was issued on August 1, 1949. The major types are shown above (Zu. #297-08, Mi. #529-40, Sc. #328-39). 03 C. - High tension conductors. 05 C. - Viaducts near St. Gallen. 10 C. - Mountain railway at Rochers de Naye. 15 C. - Rotary snow plow. 20 C. - Reservoir at Grimsel. 30 C. - Poser station on Lake Geneva at Verbois. 35 C. - Alpine postal road in Val d'Anniviers. 40 C. - Rhine harbor at Basel. 50 C. - Aerial tramway from Schwägalp at Säntis. 60 C. - Railway viaduct near Filisur. 70 C. - Triangulation tower at Finsteraarhorn. All of the denominations were issued in sheets of 50 stamps, but they were primarily intended for dispensation in vending machines. The 5 C., 10 C., and 20 C. denominations were each issued in booklets containing 10 panes of 8 stamps. Complete booklets are very expensive. 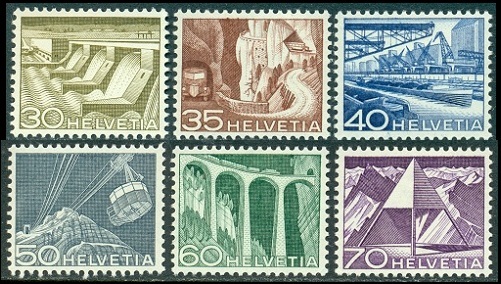 As these Swiss stamps were printed in a special sheet format (nine vertical rows) for use in creating booklet panes, they all exist in tête-bêche and inter-space pairs. The 5 C., 10 C., 20 C. (Type III), and 40 C. denominations were also issued in coils. With the exception of the 20 C., which was of a different type, the only way to tell these apart from the sheet stamps is by having examples with a control number on the back of the stamp. 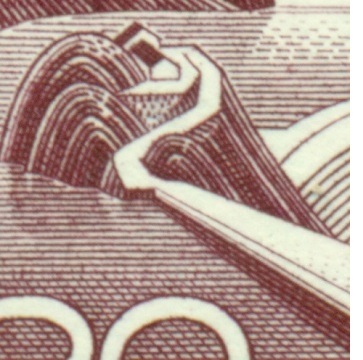 In the coil rolls, the back of every fifth stamp had a control number printed on it. These control numbers were printed on top of the gum, so there is no way to tell used coil stamps, that have been soaked off envelopes, apart from the sheet stamps. Most of the mint condition control number examples from this set are pretty expensive. The RARE 20 C. first printing (Type I) is shown above, at the top (Zu. #301, Mi. #533I, Sc. #332a). The originally issued 20 C. (Type II) is shown above, at the bottom left (Zu. #301A, Mi. #533II, Sc. #332). 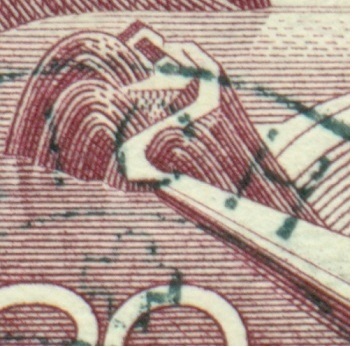 The 20 C. coil stamp (Type III) is shown above, at the bottom right (Zu. #301AR, Mi. #533III, Sc. N/L). After the printing of the 20 C. denomination Swiss stamps had commenced, it was discovered that the original die had been too lightly engraved, which caused printing difficulties and loss of the fine details. The original die was then re-engraved to strengthen the design. The re-engraving caused a couple small differences in the printed stamps, which went unnoticed at the time. This re-engraving (the so-called type II) was completed before the new stamps were issued, and it was these Type II stamps that were actually issued on August 1, 1949. The stamps printed from the original engraving were released to some post offices between December 1949 and March 1950. 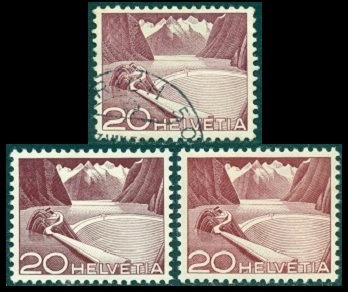 It wasn't until sometime in 1951 that the differences between stamps from the original engraving and from the re-engraving were noticed by Swiss philatelists. By this time, all the stocks of the original engraving had been sold, and most of them had been used for postage. It is estimated that about 900,000 stamps of the first printing (Type I) were produced, before printing was stopped and the die was re-engraved. Because they were considered common definitive stamps at the time, many were probably thrown away, so the survival rate of the Type I stamps is estimated to be less than 1% of the original volume issued or about 9,000 stamps! Today, a MINT NH example of the Type I stamp is about $4,000 and a USED example is about $70. Conversely, it is estimated that around 1.5 billion stamps of the re-engraved printing (Type II) were produced. The Type II stamps are very common, and they have minimal value. Three horizontal lines between the rock in the foreground and the edge of the mountain. No baseline on the house. No diagonal lines above the "20" and the "H" of "Helvetia". Two horizontal lines between the rock and the edge of the mountain. Heavy diagonal lines above the "20" and the "H". Fewer diagonal lines above the "20" and the "H". Lines at the left do not touch the rock.